BALTIMORE, Md. 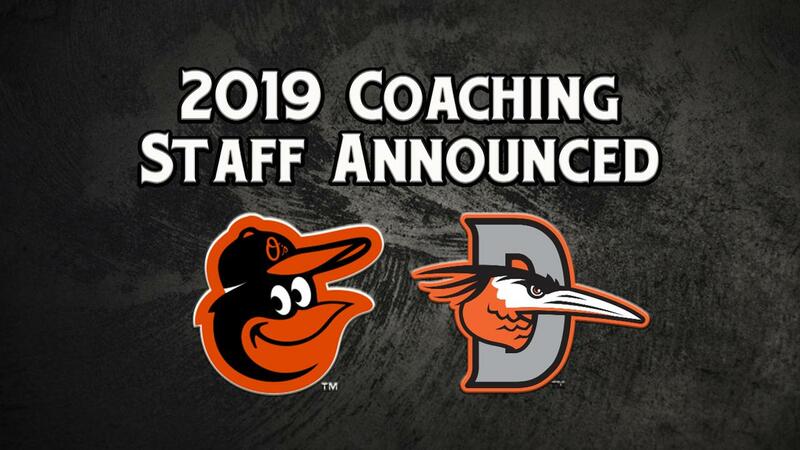 -- The Delmarva Shorebirds along with the Baltimore Orioles are pleased to announce the 2019 Delmarva Shorebirds Coaching Staff. Kyle Moore will serve as the Shorebirds' skipper, after managing Aberdeen during the 2018 season. Moore, who begins his 10th overall season in the organization, returns to Delmarva after serving as the Shorebirds' Hitting Coach in 2016. He previously served as Frederick's Hitting Coach for 2017 and half of the 2018 season. He also served as a player/coach with Delmarva (2015), Double-A Bowie (2014), and Class A-Advanced Frederick (2013), and as the Strength and Conditioning Coach with Delmarva in 2012. Justin Ramsey will join Moore as Pitching Coach for Delmarva. Ramsey has spent the last four seasons as a coach at Nova Southeastern University (FL), after serving as a coach at Long Beach State (CA) from 2010-14, and Sacramento City College (CA) from 2005-10. Matt Trate enters his first professional coaching season as the Shorebirds hitting coach. Trate has served as an Associate Head Coach and Recruiting Coordinator at Goldey-Beacom College (DE) from 2016-18 after serving as the Hitting Coach and Recruiting Coordinator at Cecil College (MD) (2011, 2013-14), and an Assistant Coach at the University of Akron (OH) in 2012. Pat Leyland enters his first season as a Development Coach for Delmarva after most recently serving as a player/coach with the Baysox in 2018. He spent six seasons as a minor league player with Detroit (2010-14), and Seattle (2015) after being drafted by the Tigers in the eighth round of the 2010 First-Year Player Draft. Adrian Gonzalez enters his second season as Athletic Trainer with Delmarva after serving in the same role for Aberdeen in 2017 and the GCL in 2015-16. Kevin Mixon will return for his second season as the Shorebirds' Strength and Conditioning Coach. Mixon was previously with Aberdeen in 2017. "We are thrilled to welcome this year's coaching staff to Delmarva and look forward to working with them throughout the season. We're excited for a successful 2019 campaign led by this dynamic staff," said Shorebirds General Manager, Chris Bitters. Opening Night at Arthur W. Perdue Stadium is set for Thursday, April 11th against the Lakewood BlueClaws at 7:05 PM. Tickets for Opening Night are now on sale and can be purchased online at www.theshorebirds.com/tickets. Full season, half season, 22 game, and 12 game ticket plans can be purchased online at https://www.milb.com/delmarva/tickets. For group outing information, contact the Shorebirds at 410-219-3112.